Boise’s latest brewpub has opened in the Downtown/North end area and it was immediately evident that I waited far too long to make my inaugural visit. 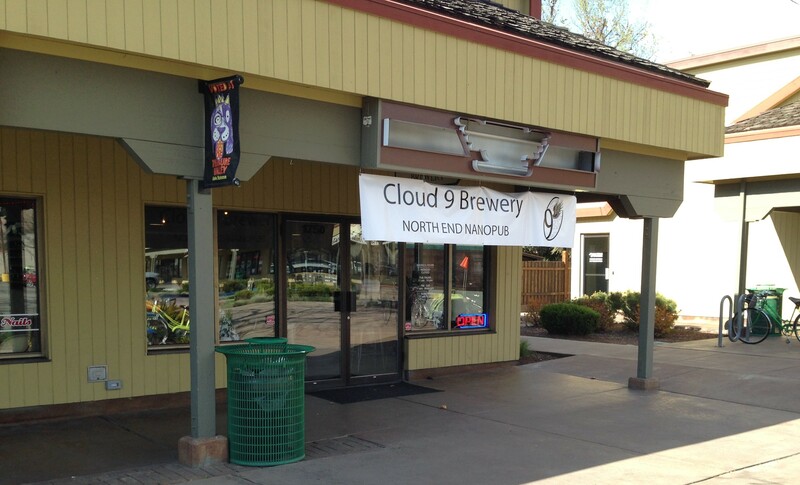 Over the last few months, Woodland Empire, and Edge Brewing have thrown their hat into the ring of the Treasure Valley craft beer scene,…and now Cloud 9 Brewery is right on their heels. Evidently they had about a dozen of their creations lined up on opening day, but after “3 weeks of standing room only” according to Ian, C9’s Beer Bar Czar, they were down to only 5 when I finally stopped by. A quite small space, tucked away in a strip mall between a nail salon and a fitness center, seating about 30 and the brewery “tour” took all of 3 minutes. All 5 of their 4BBL fermenters were busy doing that voodoo that they do, trying to supply reinforcements. They have a Barrel count on their chalkboard that, as of this writing, shows 49 Barrels brewed. At the moment, the second batch of the “Salted Caramel Stout” was in primary, going nuts and foaming out of the blow-off tube all over the brewery area floor. I tried the entire available line-up and they were all good. Across the board, I thought they were not very hoppy. The Pale Ale for instance was listed at only 26 IBUs and my server pronounced the DIPA at over 120. The latter sure didn’t taste like it but there was nothing wrong with any of them and they were all very tasty. The Porter and the stout particularly are going to be easy entries for the style for folks that think they don’t like “dark beers” Salted Caramel Stout…..seriously. They pull it off though and there is just a touch of salty-sweetness that betrays its namesake. Chatted with the owners Jake and Maggie, they were kind enough to set aside some time for me. We agreed that their very busy first few weeks, was a good problem to have. There have been negotiations with other local breweries with larger brew-house, to contract out a couple batches of their most popular offerings. I’m guessing the IPA and maybe the Honey Basil. Guest kegs have kept the taps flowing, with regional selections from Hopworks Urban Brewery, Grand Teton, and a rather uncommon IPA from Deschutes, but I’m sure Cloud 9 would like their customers to see as many Cloud 9 beers on tap at any given moment. I know I would. The food menu is a simple but upscale local and organic selection that I have already heard quite a bit of positive, anecdotal compliments about. The grilled cheese w/ brie and provolone sounds great and I am betting their Burnt Creme (Creme Brule’) pairs well with the Salted Caramel stout. Either way, I’m trying that duo. Here’s to Cloud 9 Brewing, Boise’s most recent in the growing craft beer landscape. From here, it looks like it is off to a great start.